The Knock Out® Rose has become a landscape mainstay rose across the country. Knock Out® Roses are now available in an assortment of colors and double flowers. Introduced in 2000, they have won many awards for their landscape hardiness. Plants can be used as hedges, accent plants, in perennial borders, and even in highway medians. Knock Out roses can grow virtually anywhere, as long as they are in a sunny spot, and are relatively pest and disease free. These bountiful bloomers reach 4’-5’ in height and width, but can grow larger in mild climates. Plants bloom early spring until the first hard frost. Seasonal pruning can help control size in small gardens. Rose ‘Radrazz’, or the original red Knock Out shrub rose, produces single bright raspberry red blooms in abundance. This rose is self cleaning and does not need to be dead headed like other hybrid roses. Lovely deep green leaves make this rose even more beautiful and functional in the landscape. In warmer climates, Knock Out rose can be semi evergreen. Though these roses are extremely tough, cultural care still comes into mind. Like other roses it’s best to water in the morning, to avoid potential fungal outbreaks. 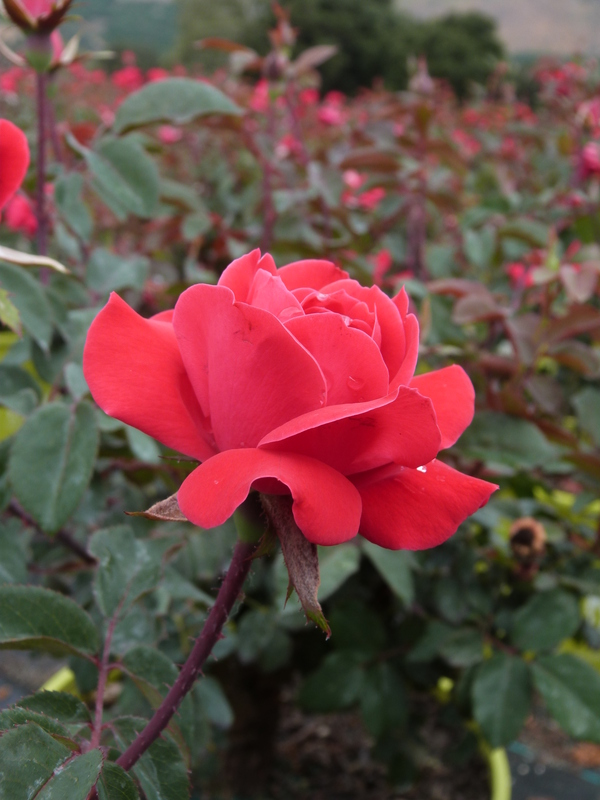 Be sure to apply water at the base of your roses, avoid unnecessary water on leaves to keep fungal diseases at bay. Knock Out roses prefer well draining soil and are most vigorous in full sun. These roses benefit from regular feedings.